When the phrase "speak now or forever hold your peace" is uttered during a wedding, someone might feel bold and actually say something...but having someone challenge the groom to a duel? 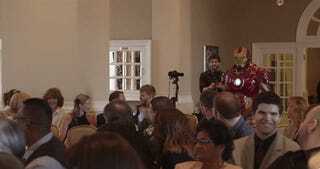 Hell, having characters like Batman and Iron Man suddenly pop up, intent on interrupting the wedding? Now that's unexpected—but it's exactly what happened at Adam Bohn, CEO of Artix Entertainment/creator of AdventureQuest Worlds, and Michelle Chang's wedding. The comic characters aren't the only ones that make an appearance, though—it seems that many evil dudes would have liked to stop the sweet wedding. It's a rather entertaining situation, if not a tad ridiculous. The entire thing is staged, obviously, but no less fun—it helps that the priest was a huge fan of old school wrestling, which is also full of spectacle. And, curiously, there will be a video game recreation of this wedding too on AdventureQuest Worlds. It'll happen on Friday, December 13th of this year—and attending is free.